Dayanidhi Maran has the record of being Union minister twice. Both times he had to resign midway. He has fought several allegations of corruption, and come out clean. 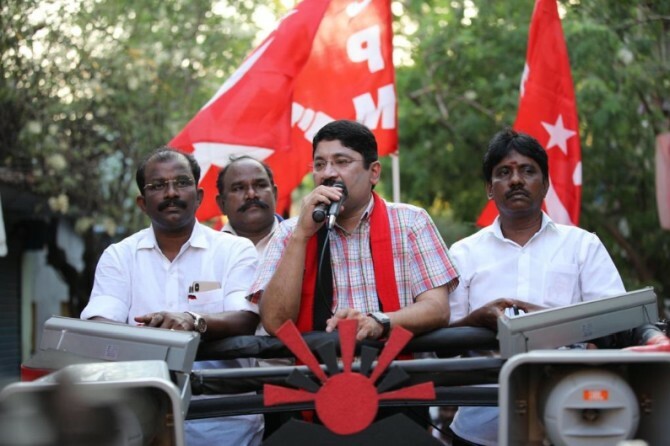 Maran currently faces a case of misusing his MP quota phone, but like all other allegations against him, this too may not stand the test of time. He has once again got a Dravida Munnetra Kazhagam ticket to contest, not from some distant rural constituency where people are said to be naive but from the Tamil Nadu capital of Chennai. Not just anywhere in the state capital, but from its heart, Chennai Central. From what we saw in the constituency it looks like a cakewalk for Maran. He has won twice from this constituency, but in the last election lost to the All India Anna DMK which swept the state winning 37 out of 39 seats in the Lady vs Modi wave. The two seats the AIADMK lost were won not by the DMK, but by the Bharatiya Janata Party and the Pattali Makkal Katchi. The Chennai Central parliamentary constituency comprises the assembly seats of Thiruvallikeni, Egmore, Harbour, Villivakkam, Anna Nagar and Thousand Lights. There are more than 1.3 million voters, with men slightly outnumbering the women. The DMK office in Thiruvelikanni is noisy, with everyone arguing about the Rs 120 million cash seizure from their candidate's house in Vellore. Kathir Anand, the DMK's Vellore candidate, is the son of former minister and DMK heavyweight Duraimurugan. According to one DMK worker, the AIADMK planted the cash. His explanation: The income tax people went there in the morning without a proper search warrant so were sent back. They came back to Chennai, got a warrant and went back to Katpadi. If there was unaccounted cash, why would they have it lying around if they knew the IT staff would come back?" Outside the DMK office, a tea shop owner says Maran had come campaigning two days ago and walked into the narrow lane to meet everyone there. A young boy who was having a cup of tea adds, "He is going to win easily. If they really wanted to give him competition, the AIADMK should have contested the seat, not its ally the PMK. The PMK is strong south of Chidambaram, they have no base in Chennai." The Tamil Nadu housing board has a low income group quarters in Egmore area. Close by are slums where women abuse each other at a water pipe, with expletives being traded like hot chips. Certainly not the right time to ask them about their electoral preferences. In the housing board quarters we meet a waste paper trader who has seen many elections. "The last time we voted for the AIADMK, but this time they are in the wrong company. We will not vote for them. And this mango (the PMK symbol) man was abusing the chief minister till last month. We are not deceived by such opportunism. We will vote for the DMK." In the Harbour area there is a huge slum of some 5,000 voters. The welcoming arch has a picture of Dr Babasaheb Ambedkar, indicating that most of the people living there belonged to the schedule castes. "Nobody has come here asking for votes, but they will come. They have to, there are 5,000 votes here. Don't be under the impression that we will all vote for the same party. There are lots of different types of people here," a young man tells me. Villivakkam is buzzing with activity at 4 in the evening. A Tata Magic vehicle, that normally plies as a share auto, brings in women to the street corner outside the main bus depot. Normally, this vehicle accommodates 15 people, but now more than 20 get down. The women do not know who is coming here. One volunteers that the AIADMK circle secretary had asked them to come. Another says the party's district secretary is coming to address them. One man standing with the mango symbol says the PMK candidate, S R Sam Paul, will soon arrive to ask for votes. The area is full of AIADMK women supporters carrying party flags. There are just five men with PMK flags. Songs praising MG Ramachandran, the AIADMK founder, and his successor J Jayalalithaa blare from a speaker atop the bus stop, also songs asking people to vote for two leaves, the AIADMK symbol. Clearly, it is an AIADMK show to canvass support for the PMK. At regular intervals, the music stops and a man exhorts people to vote for the mango symbol as the candidate had the blessings of Amma (Jayalalithaa) and Dr S Ramadoss (the PMK founder). Then, he adds, that no one can forget Amma because in "our house there is a fan, wet grinder, mixie, computer, slippers, glasses, cycle, mangalsutra and other articles" that the former chief minister had given the people. Although the BJP is an ally of the AIADMK and PMK, there is no mention of either the saffron party or Narendra Damodardas Modi. We are only two days into the campaign and the main movie has yet to play out. But it looks like a walkover for Dayanidhi Maran.